The ordeal of Mr. and Mrs. Chandler continues. 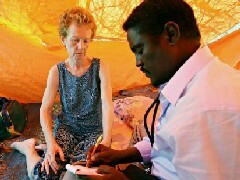 The above pictures are of the couple being examined by a Somali doctor, a Abdi Mohamed Helmi Hangul found Mrs Chandler in poor mental health, calling out for her husband. He found her husband, retired quantity surveyor Mr Chandler in a better state than his wife. Mr. Paul Chandler and his wife Rachel are being held in separate locations under 24-hour guard by their captors in Somalia, made the desperate pleas in separate taped messages. “I don’t know what to do. Will somebody please help? I just want to say, please, to my government, get me and my wife out of here,” Paul Chandler said in video footage obtained by Sky News. “We are innocent and we have done no wrong. We have no money and we can’t pay a ransom,” he added in the video which was barely audible in parts. Herewith the latest video (from Sky News) of the Chandlers. Sky News have not said how it obtained these images, or who had made them. British media reports said the film of Rachel had been made by a news agency journalist who met her in captivity. The couple were separated from each other by their captors and are being held on land. Last week, Foreign Secretary David Miliband insisted the Government would not get involved in any ransom payments to secure the Chandlers’ release. He said he could not stop private individuals from pursuing the possibility of a ransom deal, but that the Government had always made it clear that making concessions to hostage-takers was not in Britain’s interests. The pirates have said that if the UK government is unwilling to pay for their return, then their friends should raise the money. COMMENT: Whilst normally a critic of the Europhile Foreign Office and Mr. David Miliband, the British Gazette remains fully supportive of Miliband’s stance – insofar as it is aware of his stand. If it is as he states then all very well. But the British Gazette’s line is quite clear: Under no circumstances should the U.K. government pay – or otherwise facilitate – the paying of a ransom for the release of the Chandlers. Whilst it cannot stop a ransom being raised by private individuals, the Foreign Office should not make it easy for this to be done. The British Gazette makes this recommendation on the understanding that if the ordeal of the couple continues for an extended length of time, the health of Mrs. Chandler could become severely jeopardised. Whilst the British Gazette has every sympathy with the couple and their family and their friends it remains of the opinion that the only answer to the kidnappers demands for ransom should remain no.